Excelente – Muy buen producto, justo lo que buscaba, excelente calidad. Muy facil de usar e instalar, y rapido envio. lo recomiendo. This is a super gift for memories of special days like a Christening. I purchased it for a friends grandson’s Christening. We taped this to a wall and used the marker provided. We were able to nicely record all those pencil marks we had on the wall! It is attractive and our nephew will like having it at some point in his life. Lovely product. Will go with any decor and the tube will allow me to keep it for years to come. Perfect! Five Stars. Gift for a friend. Lovely design. Love this! My Granddaughter asks to be measured daily. It looks neat on the wall in the playroom – not too big. An attractive addition to the decor. Fast delivery and exactly what I wanted, so cute – thank you! Cool – I was very pleased with good delivery manners, was fast and packed well, and the item was how I was expected, all nice and lovely, Thank you. I wish I had bought this when my son was younger. I usually mark on the wall how tall he is. We’re about to move away and I was heartbroken to leave all the height marks on the wall. I purchased this so I could go back and re-mark his growth on the chart and bring it with me. Now I don’t ever have to leave his growth progress behind! Beautiful design. I bought this to keep a record of my little boy growing up. It was great value for this price and is very good quality. The design is beautiful and my wee man loves looking at it to see the animals in the tree. Bought this for my daughter’s room – easy to use and put up/remove (we have just moved house). Great buy! Talltape is the only product I have come across so far that I really wish someone had bought me or I had known about for when L was born. It is a really simple idea, a roll up height chart, but it works so well and creates a lasting memory. Unlike the standard charts that you have on the wall, this one you can just roll out the start of it and lay on the floor to chart the growth of your child literally from birth. 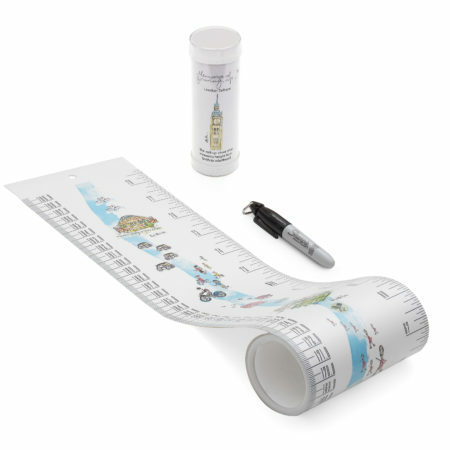 The fact it comes with a Sharpie is fab, you can keep it in the tube with the chart or hang it using the hanging hook on the pen to wherever you’ve chosen to hang your chart. Never again will you have a child in a willing mood but no pen to hand, perfect. I really do love this little product and at only £10.99 think it’s great value for money, this would make the perfect gift for families with kids of any age or expectant mums, I really have been so impressed. Very lovely wall planner. The images are very cute, timeless and my little man loves looking for the different characters on the tree. Great value as this comes with a mini pen to use with it and it can be rolled back up and put back into the tube package, making it a nice keepsake when we are finished using it. Excellent height chart. This was bought for our Messy Church group so the children can compare their growth over a period of time. It is very good quality and will easily last for several years. For people who move a lot or have a small place and don’t want to keep so much stuff, this is the ideal children’s height chart. Starts from 0cm, so you can already record size from birth. Stores well, is washable and is small when rolled up. Does what it promises:-). It’s made from a strong and robust material similar to normal tape measures. This is fabulous as it minimises the risk of rips and tears – essential for rip-happy toddlers. The length also stretches to an impressive 2m / 6ft 6″ (well beyond that of many more traditional height charts) so can accommodate the tallest child and dinkiest of babies straight from birth (newborns can measured lying down – genius!). The markings are also in imperial and metric making it a fab reference point for filling out medical documents and red books. At £10.99 each, with a flat rate of £2.99 for UK P&P, it’s miles cheaper than a wooden monstrosity. The best bit? When the kids are simply ‘too cool’ to have this on display, it’ll live in their memory box ready and waiting until my children become parents themselves. This is a fantastic alternative to marking your walls where Talltape can travel with you as you mark your child’s growth and it easily rolls up. We love this as space saver as well as a way preserve it as you move or decorate your home. Additionally, we love the chic designs on the Talltape that are fun, vibrant and interesting for both boys and girls. I wanted a small, unobtrusive measuring tape that goes from 0 to over my head for measuring kids, and it delivers. It’s not self-adhesive so I had to figure out how to hang it myself, but that’s not a huge deal for me. I also love that it’s in both cm and inches as I really needed the cm side. 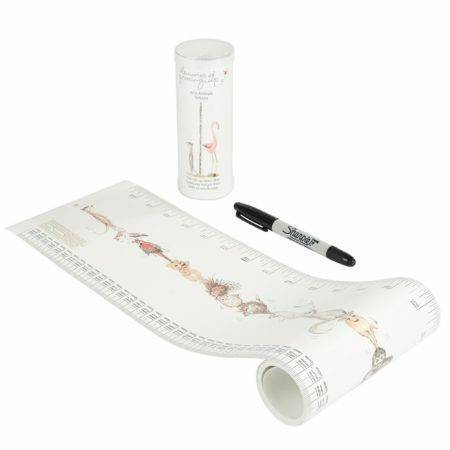 The portable, keepsake growth charts, which make unique baby shower gifts, are made of sturdy, flexible plastic that can be rolled up and taken along wherever your child’s childhood takes you, but that look stylish on the wall now. Love it ! It’s plastic, I don’t have to worry my little one will tear it apart . Absolutely fantastic quality and the perfect size to fit on a narrow wall which we recently had to paint over. The kids both love this chart and I’m sure it will last many years to come. The other week, hubs and I were talking about how we must start measuring Ethan’s height, now that he can stand, as he seems to be growing fast… We started to research different growth chart options, from posters to canvases and that’s when we came across Talltape. The tape itself is made from a durable plastic material which is easy to write on but sure to stand the test of time – just what you want from this kind of product… The colourful illustrations were even more beautiful in the flesh and we particularly love how the prehistoric creatures are organised according to size / where they would have roamed, with the sea dinosaurs at the bottom right up to the Pterodactyl at the top. Each one has its name next to it, so it’s useful for learning purposes too. There’s also something else I came across on the Tall Tape website that piqued my interest. The Memories of Growing Up USB stick struck me as such a simple, but wonderful, idea. It’s a beautifully designed and presented USB stick to keep all your special photos and mementoes on, so they are safely stored away and can be added to at any time… People often say to me that they don’t know where I find time to keep the records and albums and scrapbooks that I do but I think that this USB stick is the perfect solution for anyone, no matter how busy they are or how they like to record important things. Made a wonderful gift, thank you! Great present for my grandson! Absolutely perfect! It is narrow enough to provide a range of areas in the house to use it yet tall enough to last until my children reach 6 foot 6 3/4. The pictures are simple, interesting, and great for boys or girls. It is made of a strong and durable material. I highly recommend this product. Lovely item for nursery. Excellent product and service. We chose this measuring chart for two reasons. First, we wanted a tape that was long enough to last a lifetime and also one that was portable, so it does not just get stuck as a wall decal when we move. The tape did not disappoint. It is very strong, and I just chose to fix it with a few poster strips on the wall. The design of the animals drawings may be a matter of taste, I personally find it quite successful. It also leaves sufficient space between the scales and the design to fill in name and dates. We were wondering whether we’d get this in time for our little one’s first birthday, but we did thanks to service of seller and deliverer. I was very pleased with the prompt service and careful packaging of this item. Equally the USB was of excellent quality and now I feel as though I should save it for a special occasion to give to my daughter rather than just use it as just a back up. I’ve always loved the idea of marking out your kids’ heights on a wall or doorframe. I picture years and years of scratch marks recorded in the laundry room, a record of growth spurts that remains well after they’ve headed off to college. But the chances that you’ll stay in the same house—with the same laundry room—for all of those years is, for most of us, slim. So whenever I see a good alternative, I can’t help but take note. This one is called Talltape, and what I like about it (because there are a few options out there now) is a. it’s portable, and can be rolled up into a canister for storing if you don’t want to display it all the time; b. it’s wide enough to mark multiple children on one and tall enough to stretch into most adulthoods; and c. it comes in basic white! like your wall! (In addition to fairies and the like.) Most of the ones I’ve seen are covered in art I’d likely grow tired of and only stretch to three or so feet. You can take it with you when you move house, unlike the door frame we had used, and it takes up hardly any space. Good thing, beautiful memory! I love buying little baby clothes and toys as gifts but when you don’t know what gender the baby will be or it is a second or third baby buying gifts is a little difficult. I know as far as I am concerned I have a lot of baby things already so there is actually very little I need to be bought for us. This is why the Memories of Growing Up USB stick is such a great idea. It is packaged in a lovely presentation box and makes a perfect, high quality gift. It is a really useful idea and I know lots of mums would love the idea of storing all those precious baby photos on a gorgeous memory stick like this. Cool idea from the UK – the Memories Stick – great keepsake gift for new parents! Faced with the arrival of a baby your first thought is to romper suits, nappies, wipes, etc. But I was looking for something a little extra that would last a long time for the parents and child;-) My attention was drawn to this very nice height chart in various designs. Was a good idea and fortunately no one else had thought of the same. Very pleased with this purchase and very pleased with the speed of delivery and the item itself. Well pleased with this wall chart, can’t wait to get it straightened out for our grandson to give it a go, keep measuring him till he’s had enough. i would definitely recommend this item to have in a child’s bedroom and measure him or her on monthly basis to keep track on their height. my grandson can’t wait for us to put it up on the wall to get started measuring him again. As described and made a special gift. For the mother who was going to be a grandmother for the first time. Thanks. This was a gift which was greatly appreciated. I was treated to a Talltape and found it very useful. I used it to measure my baby boy aged two months which would otherwise have been impossible to do, and then I hung it on the wall to measure his sister aged five years who found it fun on the wall of her room – will continue to use it in future and watch the progress of their growth. I highly recommend it for both personal use and for an original gift. Rosella. The USB stick has arrived already and is lovely, thank you and the ideas you gave of what it could be used for are endless. Thank you. What a fabulous idea. Ordered one which was delivered today and now have had to order 2 more for parents i have shown the item to who thought it was amazing. Looking forward to delivering them to mums and mums-to-be. Struggling to find a gift for an expectant mother? Whether they are having a baby boy or a baby girl, there is now a perfect present for proud parents which won’t be outgrown in a few months. Mum of three Camilla Warren has come up with the Memories of Growing Up USB stick, so you can store all your child’s precious photos on one device. Available in a personalised bumblebee presentation box from memoriesofgrowingup.com the 16 or 32 GB sticks in white and chrome hold 8,000 or 16,000 pictures respectively. The art work is lovely, in years to come it will be a great reminder of how my daughter grew and it packs away into such a small compact package – I get the feeling that I’ll keep this product for many years. I have bought 2 of these they are lovely, recommend to everyone. This chart is beautifully illustrated, makes a very strong impression and can be marked well either with the pen it comes with but also with other marker pens. It is large enough to accommodate the measurements of all family members and it fits on a door frame. We have also chosen it because it can be a better choice over wooden benchmarks as a keepsake. Quick dispatch and good item not sold anywhere else, thanku!! Lovely product, fast dispatch. Thank you! I had the chance to try this product out in England where it has been developed, and I warmly recommend it. A really nice idea and more substantial than expected, will accomodate several children and can also be removed to alternative site. The family love it. Such a great idea & something we can keep always, measurements won’t get lost when we paint the door again! Children grow up so fast but at least with Talltape you can track every inch of your not so little one’s growth – and take the record with you if you move home. Much better than markings on a doorframe, which can get painted over, this portable height chart tape rolls up into a neat canister and makes a lovely keepsake. Handily it comes with a permanent marker. I love this measure. It’s of a good quality material, unisex in design, nice illustrations and I would highly recommend it to anyone. Amazingly detailed and available in five different colours and designs, there is something to suit everyone. A must for all children and perfect as a Stocking Filler! Perfect for my son’s room. Thank you. Children love the animals, thanks. I have always watched movies and loved the idea of etching your children’s height on a door frame or wall. But what if you need to paint? Or what if you move house? Like I usually do, I turn to etsy and found plenty of gorgeous adaptations of children’s height charts. But I then thought, as gorgeous as they are, where do you put it when the kids are older? It was then that I came across Tall Tape height chart on twitter and it ticked all the right boxes. Gorgeous designs…check! Portable…check! Easy to store…check! At £9.99 each, they are reasonably priced and come with their own marker pen too. The Tall Tape is a great idea and would be a lovely little gift to a newborn so that parents can keep their measurements right from the start, or as it is so compact it would be a handy extra stocking filler too. The illustrated tall tapes will look especially good on the wall of children’s bedrooms or playrooms. Talltape is a great idea. In the future, it will give us a wonderful memory of our loved ones. As well as measuring the children’s height, you can for example record their weight or their first tooth – and you can measure babies by lying the tape underneath them. Arrived just two days after we placed our order. The chart is portable – it’s tiny! Just perfect for putting in their keepsake boxes and it’s rollable meaning you can measure your tiny newborn or your big hubby. I’m going to mark the girls together on one so they can watch themselves grow and it be something they can share. Considering it reaches 2meters/6ft6in, I think it’ll be in our family for a very long time! The chart itself starts at 0cm/in which I’m really pleased about because you don’t have to faff about with positioning the chart to the wall. Fast service and arrived on time. With this lovely Tall Tape stuff you can prove just how much you have grown by marking your height as you stand against it. It is simple to fix on the wall – even your Mummy and Daddy can figure it out, you just unroll it and stick it with something sticky like blue tack. It goes up to two metres so there’s plenty of room to grow, even for boys who eat their Weetabix like I do. Great item and brill quality fast delivery thanks. Beautiful item received as described with thanks! What a brilliant idea – just bought pink and blue tapes for a friend who’s had twins – the perfect baby present and when they are grown up they can compare their heights with their futue generations – she’s over the moon – THANK YOU. Great item. Just what we needed. Thanks. I would recommend this product, easy to use and keep compact in its original packaging. Great item. Fast delivery, good communication. A+++ Ebayer. A simple, portable height chart! Just a brilliant idea, with a really neat product, sensibly priced, swiftly delivered. The kids like it, and I like it. Definitely a keeper, and a great present idea too. What a great concept… It arrived within the time expected and was well packaged. Just what i wanted…Many Thanks!